The rumen microbiome contributes greatly to the degradation of plant fibres to volatile fatty acids and microbial products, affecting the health and productivity of ruminants. In this study, we investigated the dynamics of colonisation by bacterial communities attached to reeds and cottonseed hulls in the rumen of Tarim red deer, a native species distributed in the desert of the Tarim Basin. The reed and cottonseed hull samples incubated in nylon bags for 1, 6, 12, and 48 h were collected and used to examine the bacterial communities by next-generation sequencing of the bacterial 16S rRNA gene. Prevotella1 and Rikenellaceae RC9 were the most abundant taxa in both the reed and cottonseed hull groups at various times, indicating a key role of these organisms in rumen fermentation in Tarim red deer. 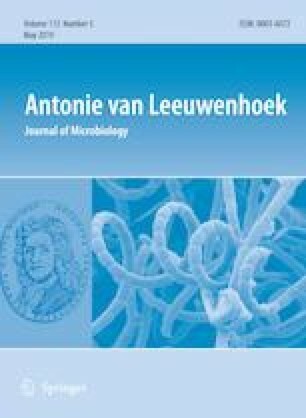 The relative abundances of cellulolytic bacteria, such as members of Fibrobacter, Treponema 2, Ruminococcaceae NK4A214 and Succiniclasticum increased, while that of the genus Prevotella 1 decreased, with increasing incubation time in both reeds and cottonseed hulls. Moreover, the temporal changes in bacterial diversity between reeds and cottonseed hulls were different, as demonstrated by the variations in the taxa Ruminococcaceae UCG 010 and Papillibacter in the reed group and Sphaerochaeta and Erysipelotrichaceae UCG 004 in the cottonseed hull group; the abundances of these bacteria first decreased and then increased. In conclusion, our results reveal the dynamics of bacterial colonisation of reeds and cottonseed hulls in the rumen of Tarim red deer. Wenxi Qian and Zhipeng Li have contributed equally to this work. The online version of this article ( https://doi.org/10.1007/s10482-019-01260-0) contains supplementary material, which is available to authorized users. This study is supported by the Opening Project of Key Laboratory of Tarim Animal Husbandry Science and Technology, Xinjiang Production and Construction Group (Grant No. HS201702) to ZPL, and National Natural Science Foundation of China (Grant Nos. 31460610 and 31660671) to WXQ. We declare no conflict of interest exits among the authors, and manuscript is approved by all authors for submission. All authors declare that the work is original research that has not been published previously, and is not under consideration for publication elsewhere. All animal care procedures were approved and authorised by the animal ethics committee of Tarim University.